Testimony by Bevel contradicted the physical evidence in the Routier case. For example, Bevel testified that because bloodstains on the right shoulder area of Darlie’s nightshirt contained a mixture of Darlie’s blood and each of her two children (one stain contained Darlie’s blood mixed with Devon’s and the other contained Darlie’s blood mixed with Damon’s) it showed that Darlie had to have been bleeding when the boys were stabbed. This testimony contradicts the state’s case because of the sock, found about 75 feet down an alley way that ran behind the Routier home. The sock contained Devon and Damon’s blood on it. This means that by the time the sock was deposited in the alley, the Routier children had already been attacked. However, the state never explained how Darlie could have gotten the sock into the alley without leaving a trail of blood leading to or around where the sock was found. As evidenced by the crime scene photographs, Darlie bled a great deal from her injuries. The above is a major problem because the prosecution’s own expert acknowledged she had to have been bleeding when she allegedly stabbed the boys. For the prosecution to have been correct, Darlie also had to have been bleeding when she deposited the sock (which we know because blood for each child was on that sock). 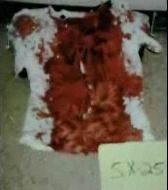 Another problem with the blood evidence is that Darlie’s nightshirt was cut and removed from her while she was treated by a paramedic. Though special care should have been taken to preserve the bloodstains on the shirt it appears the shirt was eventually placed into a bag prior to being dried. In addition, the chain of custody for the shirt, as well as the clothing removed from Damon Routier, is highly problematic. The clothing was placed into bags and taken to the fire station. The items were then retrieved from the station by police. Officer Mayne testified that he picked up two paper sacks from the fire station. He said that he opened the bags and observed blue jeans and underwear in one, and Darlie’s nightshirt in the other. Nowhere in the entire trial transcripts is there a description of which sack contained the shirt Damon was wearing when he was murdered. Was the shirt placed into the bag with the jeans or with Darlie’s nightshirt? This question remains and is important because of the possibility of cross-contamination of blood from one item onto another. Darlie’s shirt was also put into a paper bag without being folded or dried. Mayne testified at trial that there was blood on the bottom of the bag indicating the shirt had wet blood on it when placed into the bag. This could have allowed blood to seep from one area of the nightshirt onto another. This means that the information garnered from any of the clothing was questionable simply due to the lack of a process used to protect the integrity of the evidence, and then also the problematic chain of custody. The nightshirt should have been inadmissible for these reasons alone, and yet Tom Bevel was given the go ahead to testify about the two above-referenced stains on the shirt. A question that no one will ever be able to answer now is if those mixed blood stains were a result of cross-contamination. Moreover, did Bevel realize that such a serious problem existed regarding the clothing and possible cross-contamination? 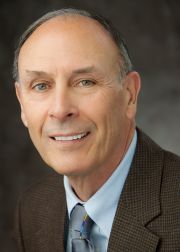 Tom Bevel, a charter member of the Scientific Working Group on Bloodstain Pattern Analysis (SWGSTAIN), has testified for prosecutors throughout the nation. His testimony has helped to secure convictions of many people. He helped to convict Tim Masters who was later exonerated in 2011 due to advanced touch DNA analysis. Richard and Selma Eikelenboom helped to demonstrate that the physical evidence retrieved from murder victim Peggy Hettrick did not match Timothy Masters. Instead, it matched Peggy’s ex-boyfriend, Matthew Zoellner. Tim’s case is detailed here. Tim recently published a book about his experiences, with the help of coauthor Steve Lehto, called Drawn to Injustice: The Wrongful Conviction of Timothy Masters. A review of the book is here. Tom Bevel originally testified that Peggy was murdered in the area where she was found. He later claimed that the prosecution had not shown him all the pertinent photographs relating to the case. Upon examining other existing photographs, Bevel stated that Peggy was murdered elsewhere and dumped in the location she was found. This was critical to Tim’s case because police and prosecutors claimed the teenager (who was 15 at the time and did not have a car) murdered Peggy near his home and dragged her body further into the field. Bevel was also involved in helping to convict Warren Horinek. The investigator, medical examiner, and district attorney all believed that Horinek’s wife Bonnie committed suicide. However, Bonnie’s parents disagreed and hired an attorney to help them obtain an indictment against Horinek. At a later trial, Horinek was convicted based on Bevel’s testimony that blood on his shirt came from him shooting his wife instead of from CPR efforts that Horinek was observed conducting. A more detailed account of Warren Horinek’s case is located here. This site contains links to information about other cases Tom Bevel has been involved in that are suspected wrongful convictions. These include Jason Payne and David Camm. As described above, Tom Bevel testified at Darlie’s trial on behalf of the prosecution. Lloyd Harrell testified for Darlie’s defense. He was employed with a private investigation firm. Before working as a private investigator, Harrell worked for the Federal Bureau of Investigation (FBI) as a special agent. At trial he testified that the prosecution’s transcript of the 911 call Darlie made to the Rowlett police on June 6 of 1996 was not accurate. He also discussed the secret wiretapping of Devon and Damon’s grave site, by the Rowlett police, stating it was an unlawful act because it violated federal law. When asked if he had seen a warrant or other document authorizing the secret recordings, Harrell stated that he hadn’t. On December 30th of 1996, before Darlie’s murder trial, Harrell met with Tom Bevel, Douglas Mulder, Richard Mosty, and Curtis Glober. He testified that Bevel made “materially different” statements during that meeting then the ones he made under oath and on the stand. During the meeting, Bevel informed the attendees that one of the issues regarding the stains in question was that they contained a mixture of Darlie and her children’s blood. 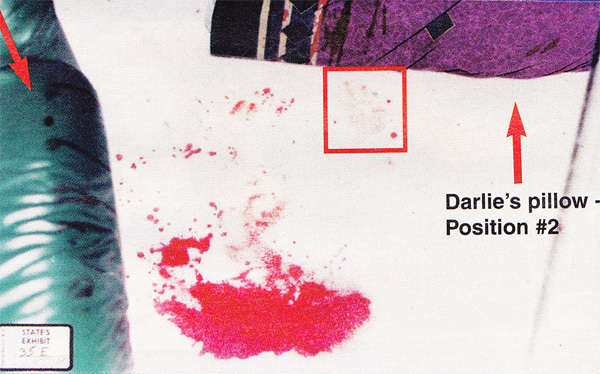 As described above, the lab reports show that Darlie was the main contributor of each blood stain. Each individual stain contained a minor contribution from each of her children. There was no way to determine how the stains became mixed. “Absolutely, for this reason: In Oklahoma City he was asked at least twice, does this mean that each of those stains, the knife tip had to contain the blood of Darlie and the blood of one of her children?” Harrell stated that Bevel’s answer was “yes”. As discussed on the evidence page, Tom Bevels name comes up in other cases that are confirmed or suspected wrongful convictions. The following include cases Bevel has been involved in and the circumstances surrounding each. Click on the links to read more about each one. The following are cases where people were exonerated after having been convicted at trials where Tom Bevel testified on the side of the prosecution. The book And Justice for No One discusses Tom Bevel’s testimony on behalf of the prosecution. Parts of the book are available here. A separate, but seemingly related problem existed with the knife as well. The prosecution claimed that a single knife was used in the attack and that the knife came from inside the Routier home. However, when the knife in question was tested for DNA only Darlie and Damon’s blood was identified on it. Devon’s blood was not. The prosecution did not try Darlie for Devon’s murder, however. They only tried her for Damon’s. Some have said that prosecutor Greg Davis only sought a conviction against Darlie for Damon’s murder because he planned to try her for Devon’s if she was acquitted. However, this does not make sense because since blood from Damon was found on the knife, and blood from Devon was not, it means the state’s case that Darlie committed the murders was stronger in Damon’s case then Devon’s. If the prosecution had been unsuccessful in getting a conviction for Damon’s murder, they would have been even less likely to get a conviction for Devon’s. Due to Damon’s age at the time of his murder, the offense qualified as a capital one. When convicted for the murder, Darlie received the death penalty. At least one juror has emerged to state that he now believes Darlie is innocent and that he made a mistake in his decision to declare her guilty. 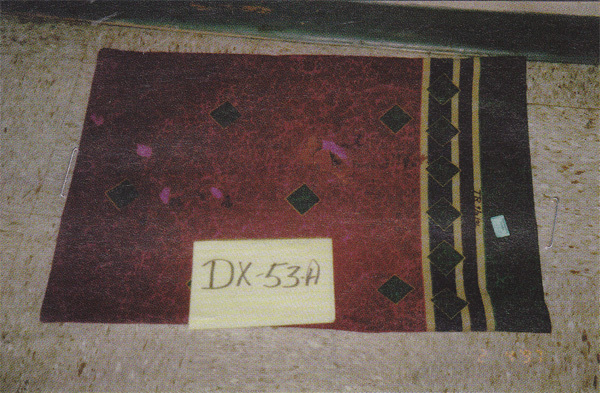 Towels found in the living room and the hallway confirmed claims made by Darin and Darlie that she had gone into the kitchen to get towels and also wet towels in the sink. A more thorough write up on the towels may be found by clicking here. The prosecution contended that Darlie cut her own throat while she stood at the kitchen sink. However, blood from Darlie’s pillow (and the pillow cover) supports that her throat was cut while she was sleeping on the couch. 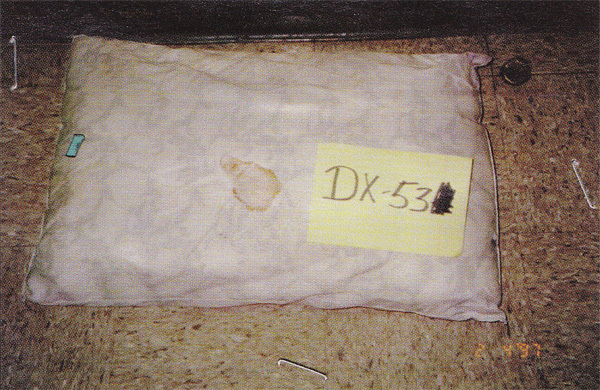 Pictures of this evidence were entered as exhibits at trial, but the myth that there was no blood on Darlie’s pillow erroneously persists to this day. Click on the pictures below to see the larger version. The blood was mentioned at trial when defense attorney Richard Mosty questioned Charles Linch. Mosty: Now, did you ever see this maroon pillow? Mosty: Did you take that? 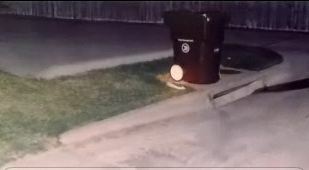 Linch: That was collected by the Rowlett Police Department. Mosty: And, it had blood, it had — this maroon pillow had blood on both sides of it, didn’t it?